Designed by nine-time Major winner Gary Player, the Lost City course is famed for its rainbow coloured bunkers that take the shape of African nations. 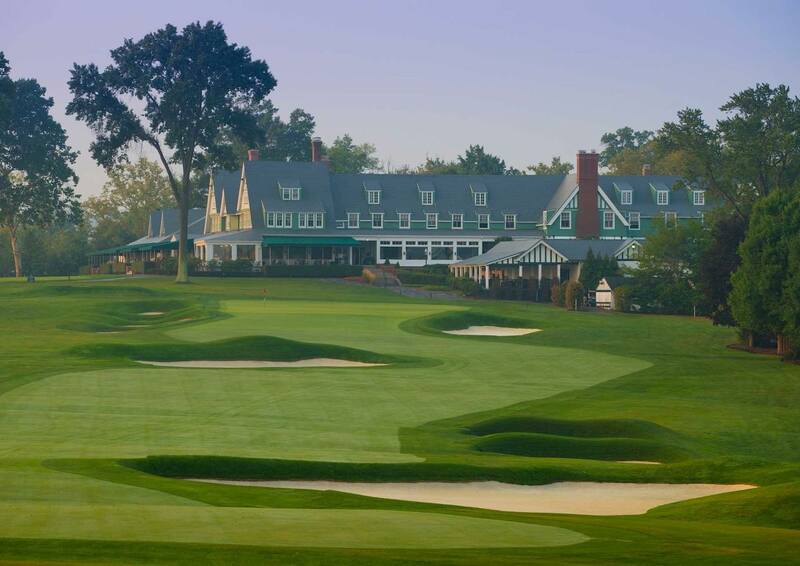 Oh, and there is also the par-three 13th hole, which has a vast pit of man-eating Nile Crocodiles guarding the green. Bizarrely, golfers are merely ‘discouraged’ from retrieving their ball by a small wooden sign. Surely an electric fence would work better? I’ve never been to Zimbabwe or Australia, but I did grow up in the, ahem, badlands of Shropshire. Several of the holes at Bridgnorth run along the River Severn, and therein lies the problem. Standing on Native American reservation in the golfing Mecca of Scottsdale, We-Ko-Pa guarantees stunning views across the Sonoran Desert. But it is the desert, and particularly the indigenous Cholla cacti, that provides the terror. 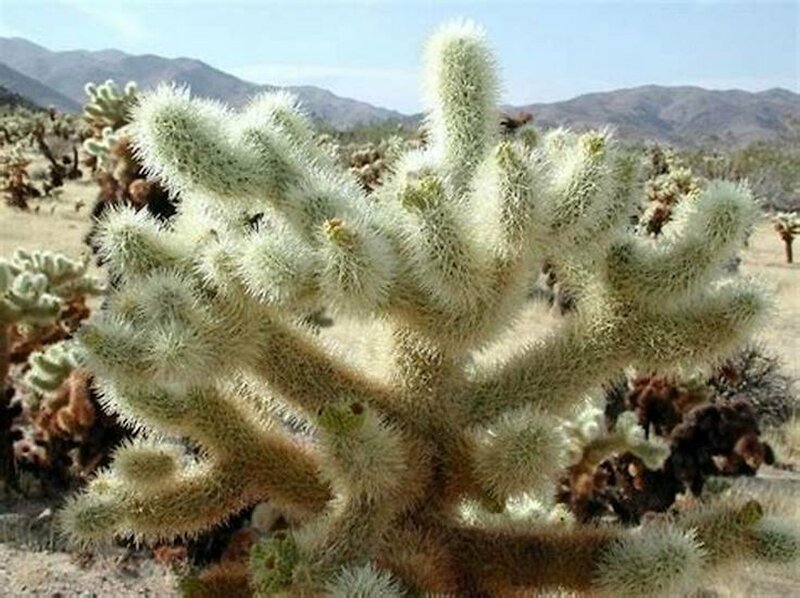 The Jumping Cholla and its cousin, the cuddly sounding Teddy Bear Cholla, literally leap off the stalk when air moves them. Nice to watch if it’s the wind that causes it, but not so nice if the movement of air comes from your leg as you search for another lost ball. And if you manage to avoid the cacti, don’t interfere with the frequent small holes; they’re rattlesnake nests. 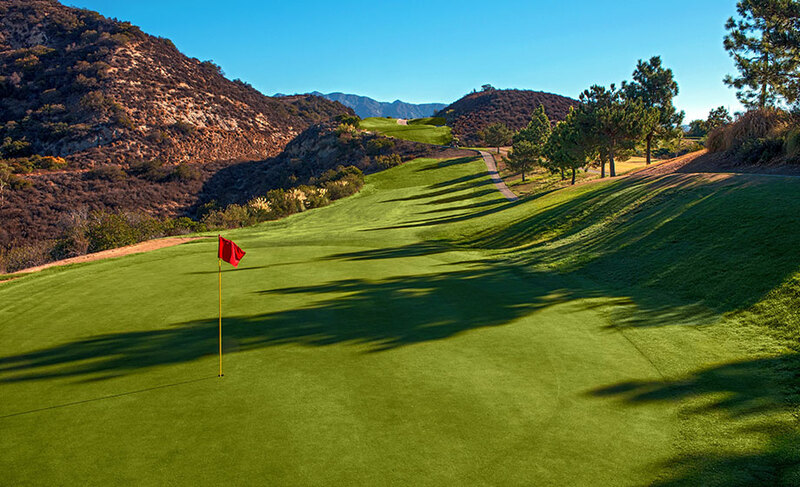 Located just off East Chevy Chase Drive, this charming little par 60 course would, in an ideal world, provide a haven for golfers looking to take a break from a long drive. Shame that, because the course was laid out on top of an old landfill site, and though the developers should be commended for turning an eyesore into a place for recreation, a little more thought may have been a good idea. Within months of opening, golfers complained of snagging clubs on old tyres and being engulfed with regular methane bursts from below. Danger, they say, lurks around every corner, and nowhere is that truer than on the peaceful Scottish island of Islay. 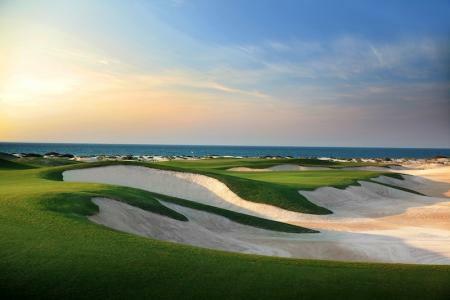 All 18 holes run through and around gargantuan sand dunes, with nearly every tee or approach shot being blind. 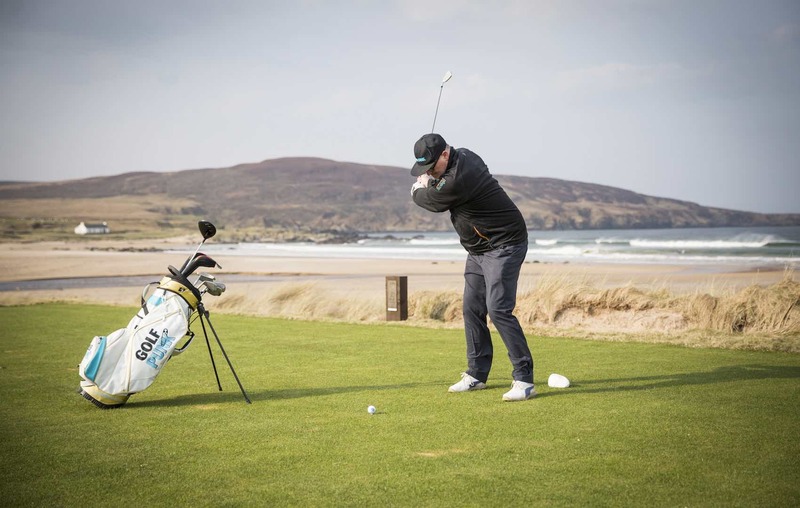 With cries of ‘fore right’ slipping away in the wind towards the north coast of Ireland, a crash helmet, hearing aid, high pain threshold and strong nerve are required. Or a hipflask full of one of the local whiskys. to high elevations,” says Bruce Keith of The Alpine Club in Canada. 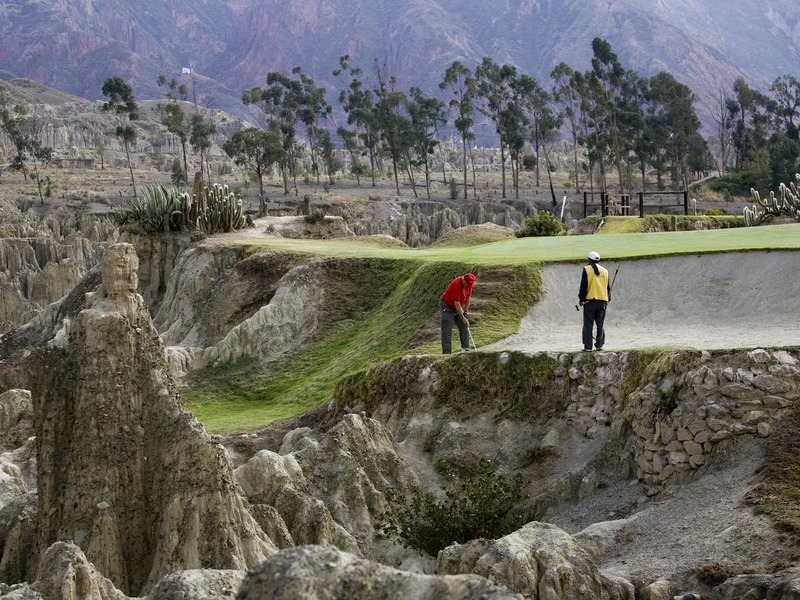 And nestling 10,000 feet above sea level in The Andes, La Paz CC certainly meets that criteria. Us golfers are a hardy bunch, but if you want to risk your life for a birdie then at least ditch the fags and burgers first. Aspirin and a donor card are a must. Polar bears. Reindeer. Frostbite. Restrictive gloves. Greens that move overnight. Inuit children throwing snowballs at you. Ice caps melting. Penguins stealing your ball. Whales mating. Huskies barking. Seals slithering onto the tee. Slipping over and breaking your wrist. Submarines smashing through the clubhouse. 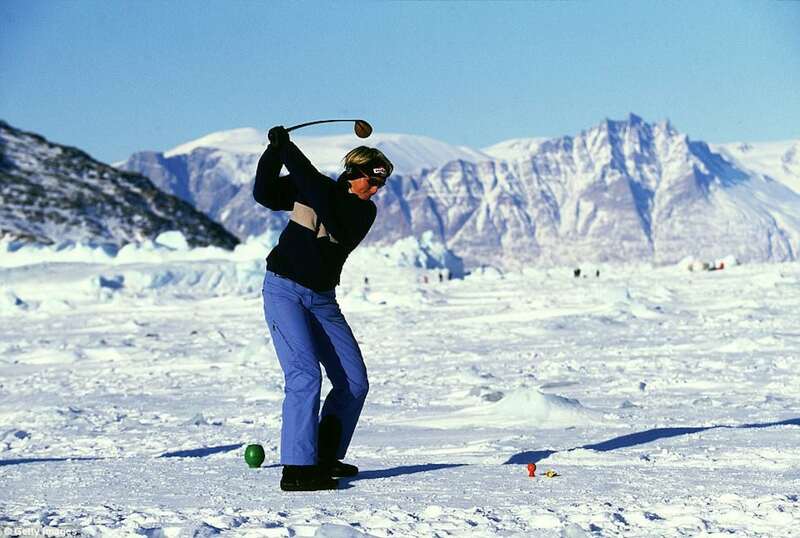 Why, exactly, would anyone play ice golf...? 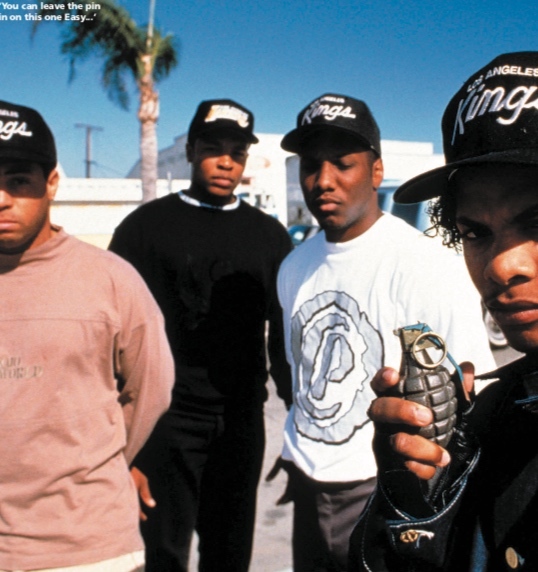 Forever enshrined by the films Boyz n’ The Hood and Straight Outta Compton, the home of Dr Dre and Gangsta rap is one of the most dangerous urban areas in America. 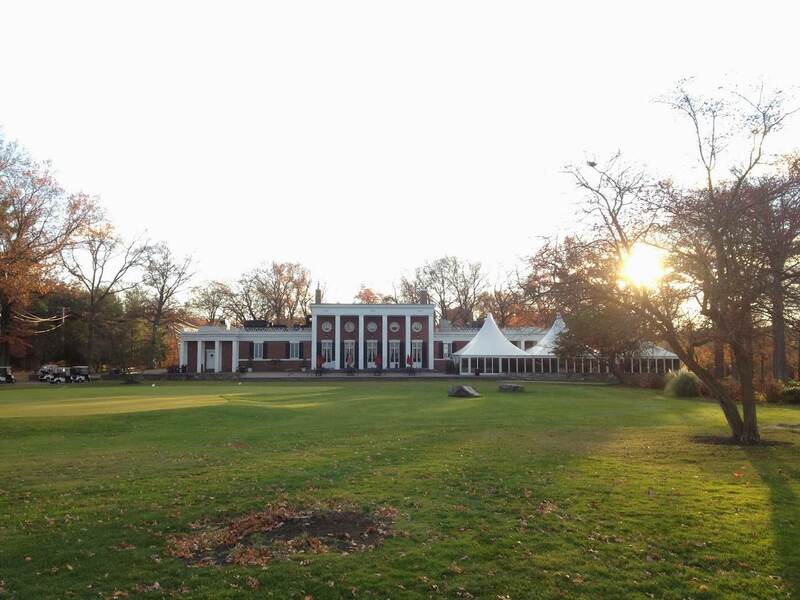 The course opened in 1958, and is located on a barren patch of grass in the south of the city. 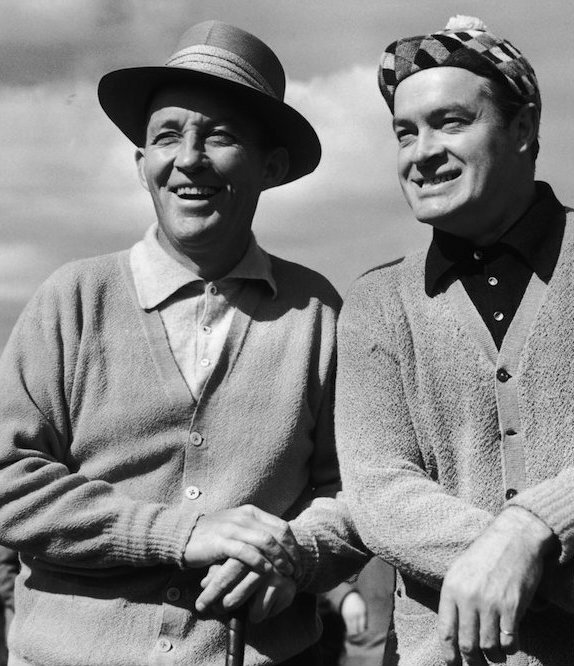 Don’t be surprised if crackling gunfire and cries of terror ring out instead of the more sedate ‘get in the hole’, as the local gangs - the infamous Bloods and Crips - are known to settle drug and turf wars over a brisk nine holes. Luckily for UK golfers, the worst thing you’ll ever encounter in the rough is a used condom or a Mars bar wrapper, but Singapore is a bit different. In the 1982 Singapore Open, pro Jim Stewart encountered a ten-foot Cobra while searching for his ball. 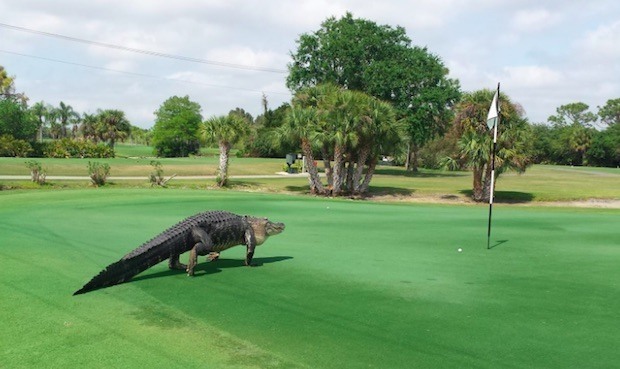 He dispatched it with a bladed seven-iron, only to watch in abject horror as another reptile crawled from its mouth. As one of the most arid stretches of desert in the world, the Nullarbor Plain is not high on the list of Australia’s tourist attractions. 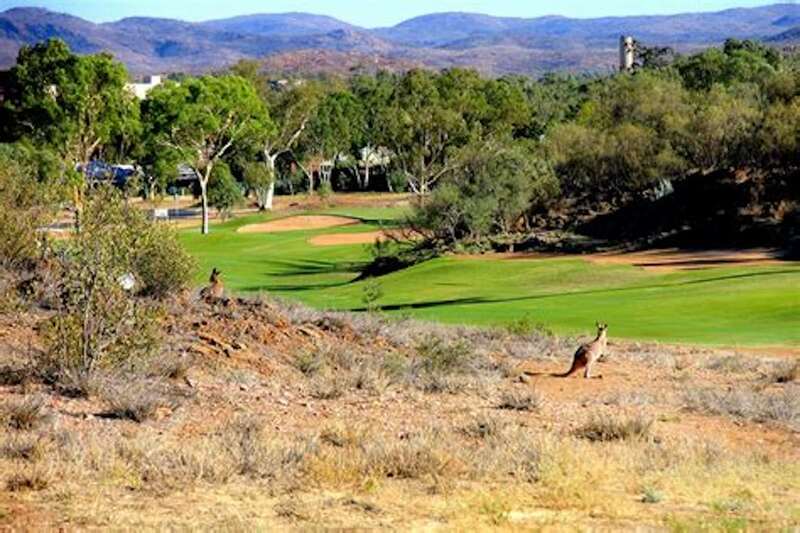 To inject revenue into the area, Alf Caputo of the Eyre Highway Operators Association has mapped out a course that stretches 1365km from Ceduna in South Australia to Kalgoorlie in Western Australia. 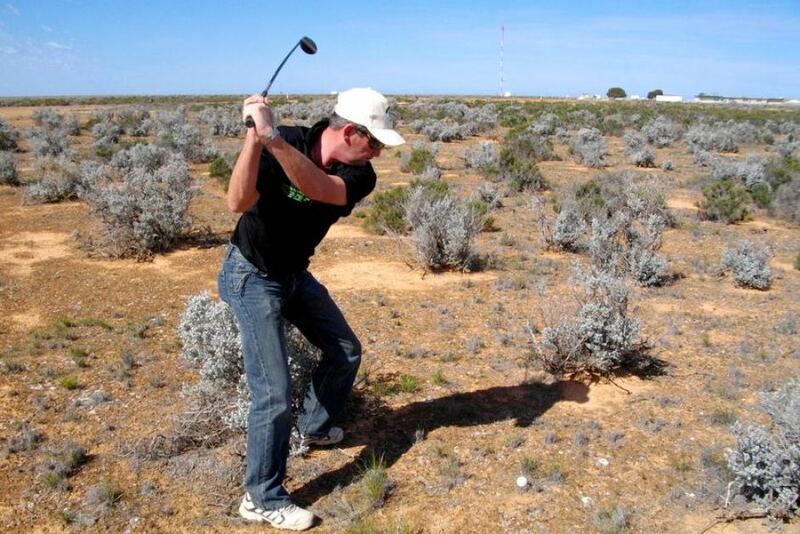 Each ‘hole’ has been cut from the bush, and keen hackers stay at a roadhouse before driving the 80km to the next hole. One hole is even on a sheep station; so if the heat, spiders or snakes don’t get you, watch out for that ram. The Beachwood course, near Durban, is framed by lush South African vegetation, featuring protected mangrove swamps, freshwater streams and a variety of endangered flora and fauna. Problem is, animals live near water and trees, and in 1997 Mollie Whitaker was neatly raking a bunker before moving onto the green when a monkey leapt from a nearby tree and started to strangle her. Luckily for her, a local caddie was alert to the situation and dispatched of the homicidal primate with a sand-wedge. Just hearing someone say ‘The Bronx’ conjures up images of Hip-Hop, Yankee Stadium, and, er, wiseguys, which is where Pelham comes in. 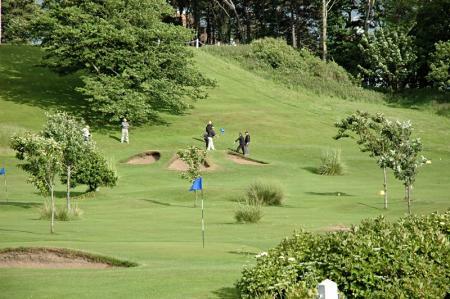 Over the last 10 years, 30 bodies have been found on this charming little links. “Hey Hank, the line’s just over that be- headed corpse.” Nice. 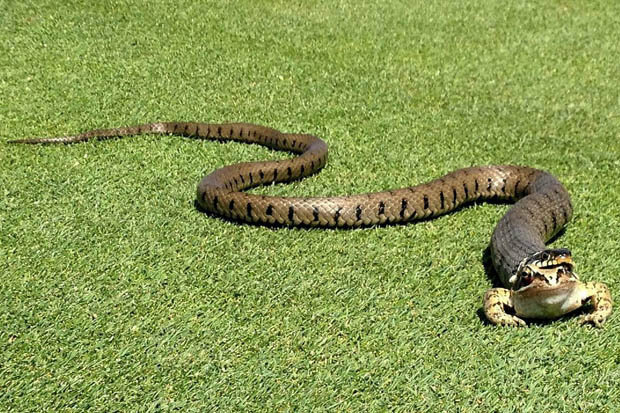 Mugabe's reign of terror may be over but playing golf in this country still has its share of hazards. 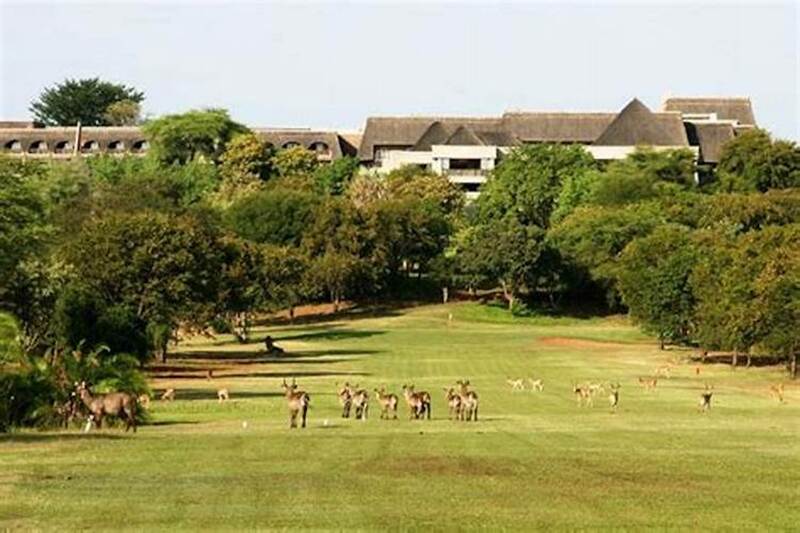 The average life expectancy in Zimbabwe is a jaw-dropping 34, and though we're not sure how many golfers have contributed to that statistic, we wouldn't fancy a round at Elehant Hills. 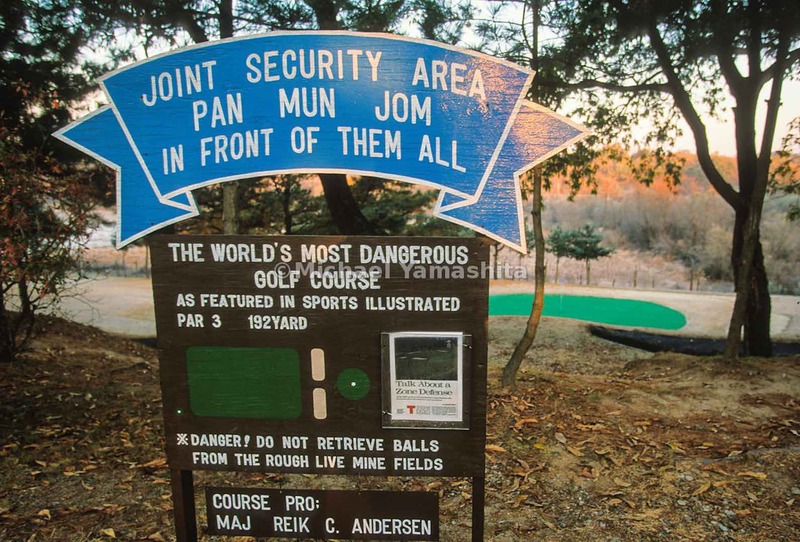 The fairways are studded with craters left by mortar attacks across the Zambezi River. When the Korean war ended in 1953, millions of civilians had lost their lives and the country was split into North and South. To the North lies Pyonyang and Communism, to the South Seoul and a thriving electrical goods fuelled economy. Perhaps the most odious on the list, the plight of the villagers of Hacienda Looc was highlighted in the 1999 documentary Golf War. 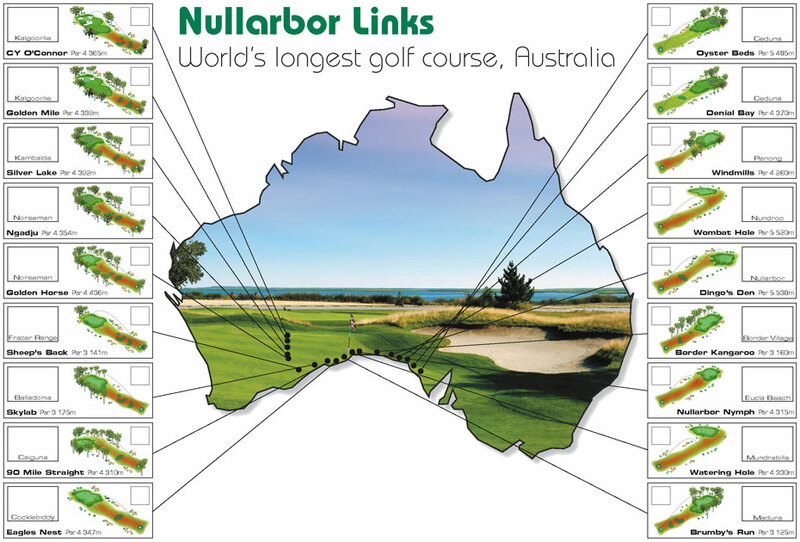 The story centres around globalisation in the form of golf course development, with villagers physically forced to leave their ancestral land to make way for a new track. 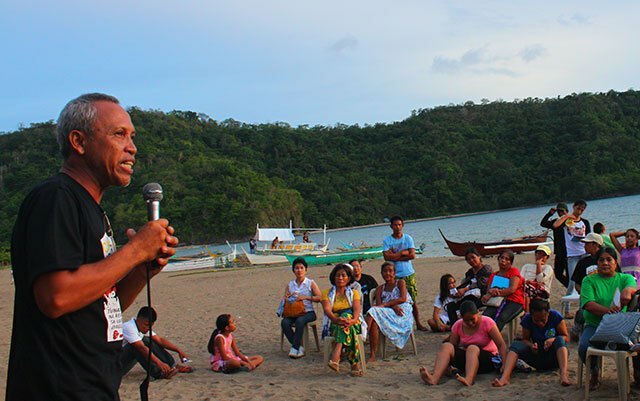 Even more worryingly, Tiger was seen in a promo shot espousing the merits of golf in the Philippines. Back in the 1970s, Afghanistan was nothing more than a tranquil idyll on the hippie trail, and The Kabul Golf Course thrived. 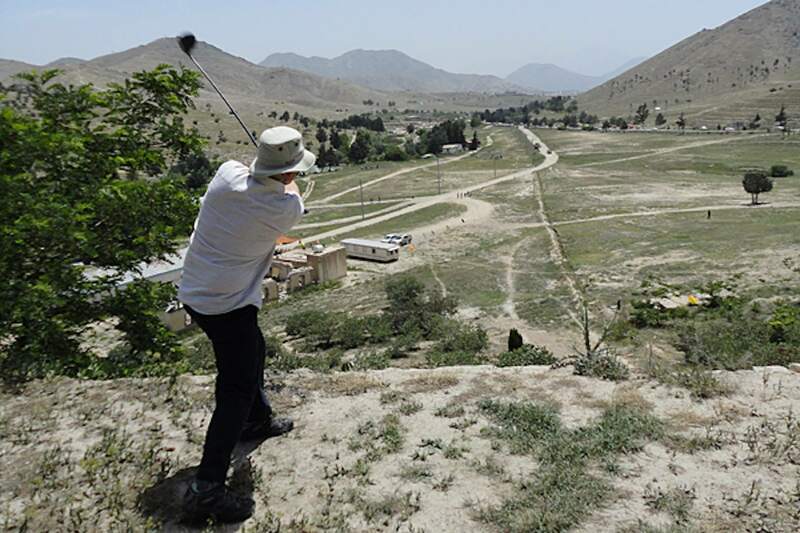 When the Taliban came to power, golf was banned along with foreign music and kite flying, and owner Mohammed Afzul Abdal was beaten with telephone wires when the regime found his golf trophies. In 2005, aid workers started the Kabul Desert Classic, but with a steady stream of suicide bombings on the road leading to the course, only the stupid, brave or obsessed need apply.